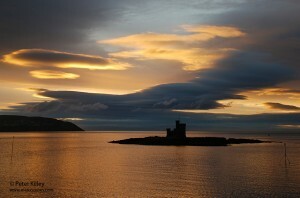 I was up at a bit of a silly time this morning 05.15hrs and could not help capturing this Sunrise over Douglas Bay. The image were captured on my Nikon D80 DSLR with a Nikon 18-135 F3.5/5.6 G AFS DX lens and cropped and resized in Adobe Photoshop CS5. Wait until you have grandchildren… 5.15am will then seem late! Jacob (nearly two and a half) came into our bed at 4.40 this morning. He did wait until he heard the clock strike 5 before he sat up saying “Time to wake up”. I was brought my slippers and the day had begun. Reminds me of the view from the old pier – the Blackboards – where, in the 1970s on return visits to the Island, I could often be found both early morning and late evening … fishing for mackerel, coal fish and the occasional cod. A wonderful way to wind down.